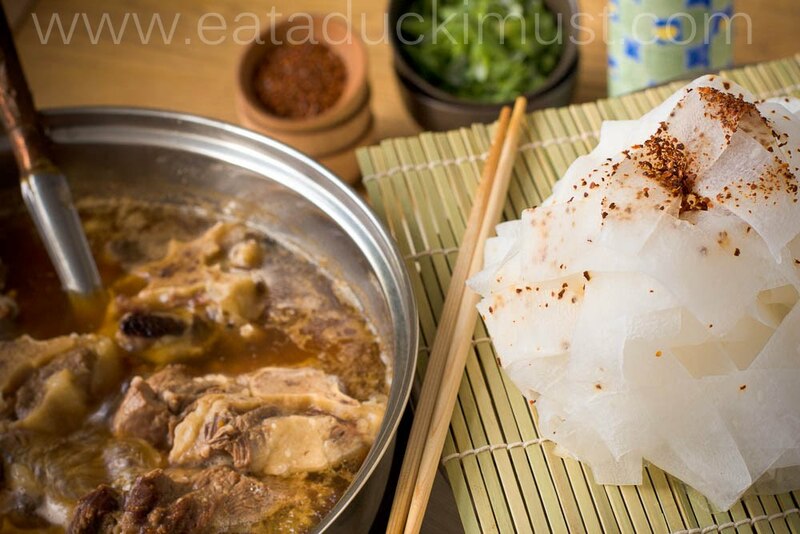 Gyu Teiru Nabe: Oxtail Hotpot — Eat a Duck I Must! Despite the brisk 8°F weather we woke up to this morning, we were really excited to get working on some food photography today because the sun was actually shining and not hidden behind layers upon endless layers of clouds. It warmed up and brightened our place which always makes me so happy. Hey, I will take any ounce of optimism any way I can get it in this bitter Chicago winter! Jared's been inspired lately by the Shunju cookbook and decided to try out their oxtail hotpot recipe from their Winter section. Hotpot is a one pot dish usually eaten during winter months. Raw ingredients are added to the soup, which helps build up the soup as the night goes on. It is also a great way to gather friends and families around a boiling cauldron of soup to keep you warm and full. I have found that as Jared makes more Japanese food at home, I tend to eat slower because the flavors are so delicate, yet so incredibly harmonious. I find myself trying to enjoy every piece of food in every inch of my bowl. Plus when I realize Jared's put a lot more meticulous effort into each part of the dish, I want to make sure I do his work some sort of justice by not scarfing it down. 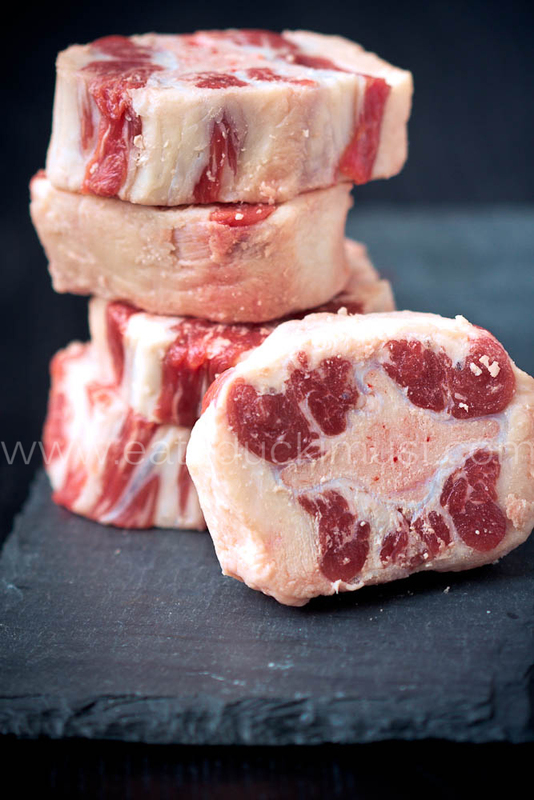 Today was definitely one of those days as he prepared this oxtail hotpot. The oxtail stock takes at least three hours and he peeled every strand of daikon noodle. How could I not appreciate this? According to the description in the book, it is one of the restaurant's most popular dishes since it opened. The oxtail soup is nice and hearty, while the crispy daikon noodles absorb the delicious broth and lends its sweetness to the dish. Peel the skin off with a vegetable peeler. Then use the peeler to peel the daikon to make daikon "noodles"
Once the soup is boiling, add a handful of the daikon noodle. Add more noodles when the previous batch is eaten. 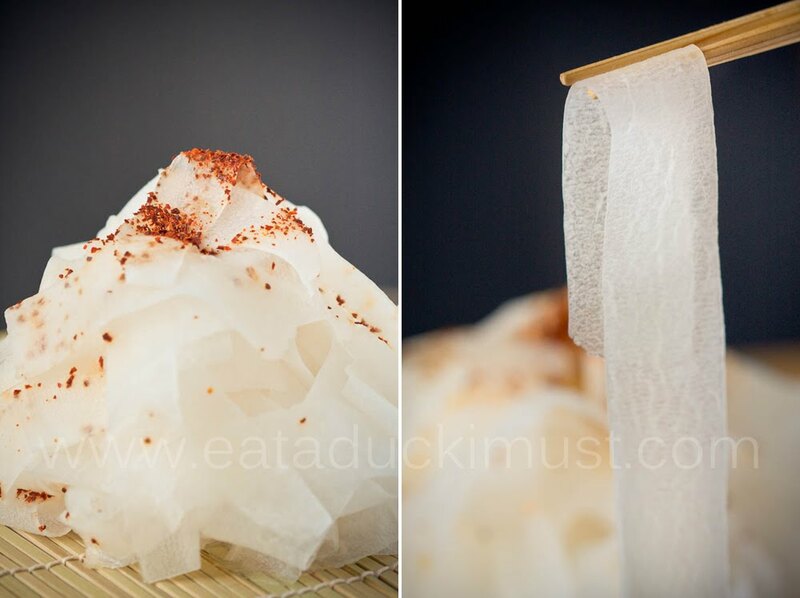 It is better to not put all the daikon noodle in at once, as the noodle will loose its crunchy texture as it continues to boil. At the end of the meal, it is customary to add rice or udon noodles to savor the soup. To do it, use a fine strainer to remove most of the bits and pieces left in the soup. Ladle most of the soup out, leaving about 1 cups worth. Add in 2 cups of cooked rice/ udon noodle and 2 beaten eggs with the heat on. Once the eggs are cooked, serve immediately. Add 5 quarts of water, oxtail and the vegetables. If you're interested in more Japanese hotpot recipes, check out this collaborative book by Tadashi Ono and Harris Salat, Japanese Hot Pot.